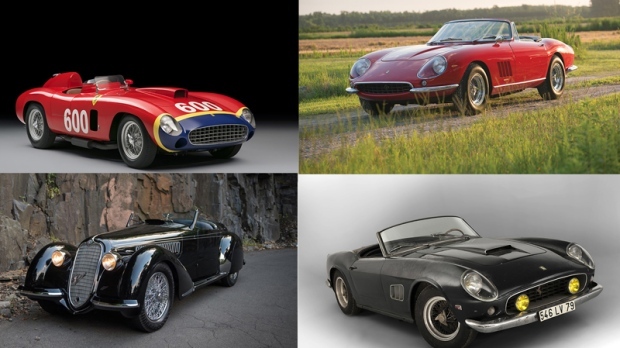 As the biggest Ferrari auction in history is about to happen at a Bonhams sale this weekend, here's a look at the 10 most expensive cars ever sold at auction. Sold in 2014 at the Bonham's auction during Monterey motoring week it is one of the lesser examples of the 250 that survives to this day. But such is the lure of the car, considered the holy grail for Ferrari collectors, and also known as the ultimate dead man's car -- i.e., the only chance of it coming to market is if its owner passes away -- that it set a world record price when it went under the hammer. Sold in Paris by Artcurial during the 2016 Rétromobile classic car show, it is the last time a big-money, blue chip Ferrari came up for auction and met or bettered its estimate. In recent months, though the collector's market is as buoyant as ever, buyers have started to shun some of the eight-figure Ferraris available for modern equivalents or even other marques. Since 2015 the average price paid for Porsches at auction has rocketed. However, not enough for any of Stuttgart's finest to break into the top 10 -- yet.